High school goal posts are 23'4" wide and 20' tall from ground while NCAA goal posts are 18'6" wide and 30' tall poles from ground. High school hash marks are 53'4" from the sidelines while NCAA hash marks are 60' from sidelines. Measurements shall be from the inside edges of the boundary markings. The entire width of each goal line shall be in the end zone. a. Limit lines shall be marked with 12-inch lines, at 24-inch intervals; 12 feet outside the sidelines and the end lines, except in stadiums where total field surface does not permit. In these stadiums, the limit lines shall not be less than six feet from the sidelines and end lines. Limit lines shall be 4 inches in width and maybe yellow. No person outside the team area shall be within the limit lines. b. 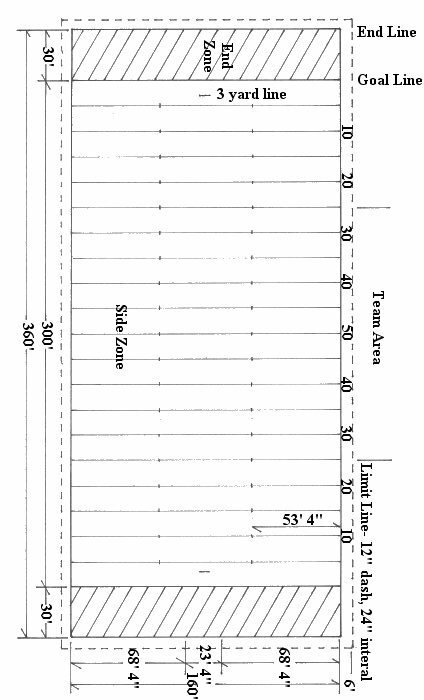 The limit lines shall continue six feet from the team area around the side and back of the team area, if the stadium permits. On each side of the field, a team area in back of the limit line and between the 25-yard lines shall be marked for the exclusive use of substitutes, trainers and other persons affiliated with the team. Limit lines designating team areas shall be solid lines. 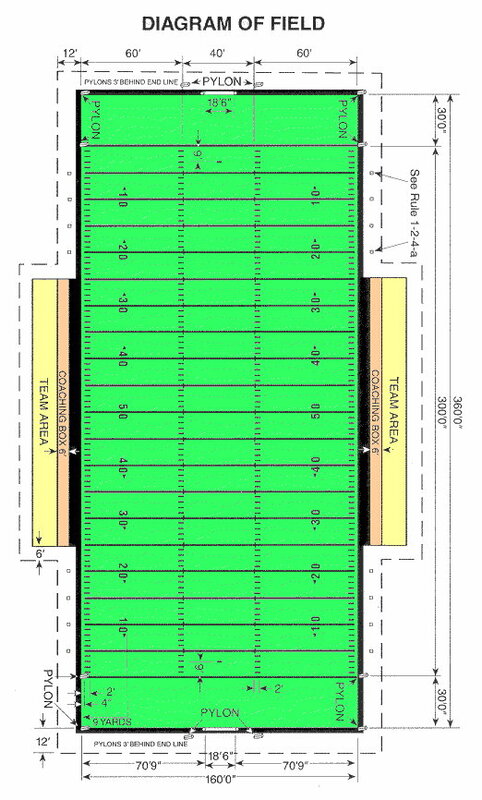 A coaching line shall be marked with a solid line six feet outside the sideline between the 25-yard lines. The area between the coaching line and the limit line between the 25-yard lines shall contain white diagonal lines or be marked distinctly for use of coaches (Rule 9-1-5-a). 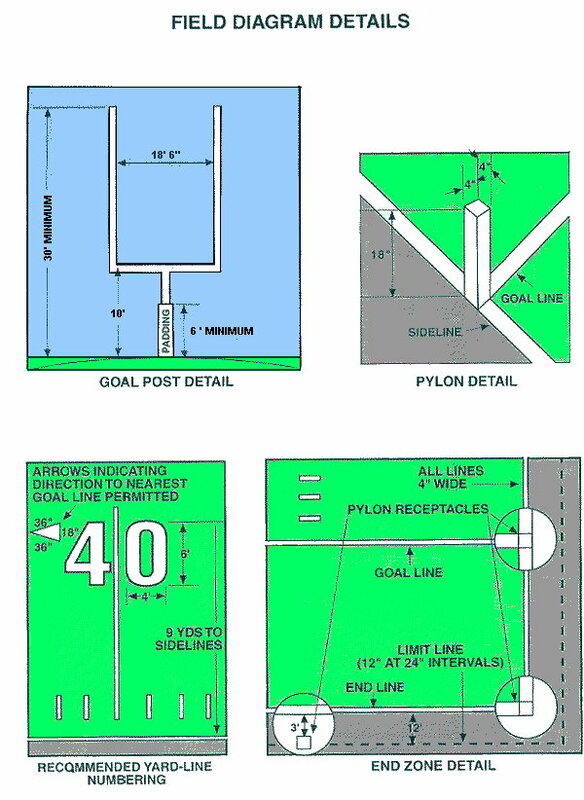 A 4-inch-by-4-inch mark is mandatory at each five-yard line extended between the goal lines as an extension of the coaching line for line-to-gain and down indicator six-foot reference points. Learn about Field Painting Strategies from sports turf managers. This easy reading tutorial covers the customer, field marking paint, plant growth regulators, precautions, football season preparations, game week activities, field marking tools, paint mixing, field striping, and painting logos from manufactured stencils and do-it-yourself layouts. A. 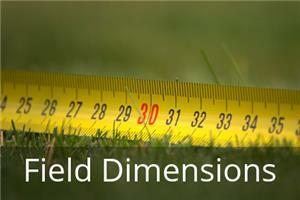 All football field dimension lines shown must be marked 4 inches in width with a white, nontoxic material that is not injurious to the eyes or skin (Exceptions: Sidelines and end lines may exceed 4 inches in width, and Rule 1-2-1-g). B. Twenty-four inch short yard-line extensions, four inches inside the sidelines and at the inbounds lines, are mandatory; and all yard lines shall be four inches from the sidelines (Rule 2-11-4). C. A solid white area between the sideline and the coaching line is mandatory. D. White field markings or contrasting decorative markings (e.g., logos, team names, emblems, event etc.) are permissible in the end zones but shall not be closer than four feet to any line. E. Contrasting coloring in the end zones may abut any line. F. Contrasting decorative material is permissible within the sidelines and between the goal lines but shall not obliterate yard lines, goal lines or sidelines. G. Goal lines may be of one contrasting color from the white lines. H. Advertising is prohibited on the field [Exceptions: (1) Permitted for any game not played in-season when the sponsor is associated with the name of that game, and (2) NCAA Football logo]. I. White field yard-line numbers measuring 6 feet in height and 4 feet in width, with the tops of the numbers nine yards from the sidelines, are recommended. J. White directional arrows next to the field numbers (except the 50) indicating the direction toward the nearest goal line are permitted. The arrow is a triangle with an 18-inch base and two sides that are 36 inches each. K. The two inbounds lines (hash marks) are 60 feet from the sidelines. Inbound lines and short yard-line extensions shall measure 24 inches in length. L. Nine-yard marks 12 inches in length, every 10 yards, shall be located nine yards from the sidelines. They are not required if the field is numbered according to Rule 1-2-1-i. 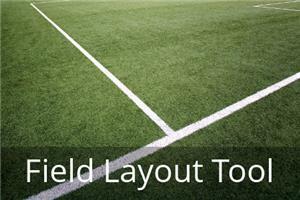 Use this set of pre-measured lines to mark your field in less time! When marking dimensions of a football field for the first time and subsequent seasons how many points or intersections should you be staking? Here's my quick calculations and why these are staking points for pulling a string line when marking a football field. Check out the different staking options using marking whiskers and associated stakes (nails and Raptor Stakes), Stake Alls integrated marking whisker with plastic stake, Tru Mark metal field line anchor with whisker plug. Save time by using Tru Mark String Winders and the feature to allow for quick string recovery using a cordless drill. We offer the 3.5' and 6' heavy duty football Sideline Number Stencil Sets and Hash Mark Stencil . How many cans of paint are needed to line a field? Make your lines and stencils stand out with Tru Mark Premium Quality Field Marking Paints . Tru Mark field striping paint for synthetic/artificial and natural turf surfaces. Click here for the advantages of using acrylic latex field marking paint for striping your sports fields. Click here to understand the cost savings advantage of using acrylic latex paint over aerosol paint.